I am finally able to report some details on (what appears to be) an authentic copy of the Turkish release of Best of U2. 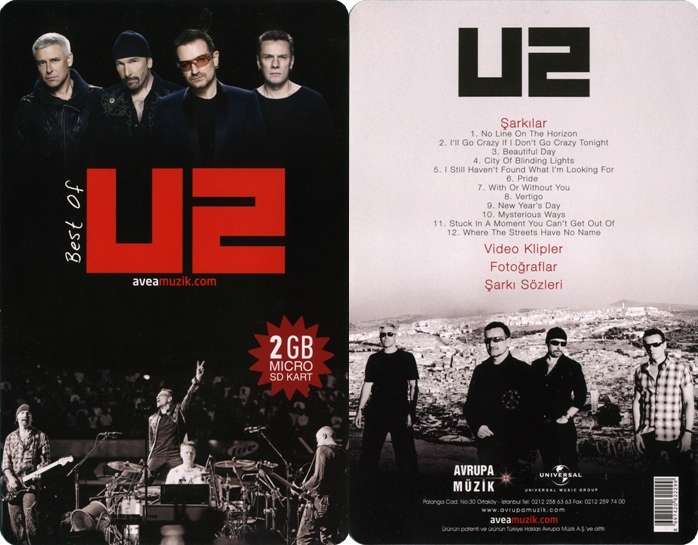 As you may recall, this was a “greatest hits” collection that was released in Turkey just before U2’s 09/06 Istanbul performance. The package includes a SanDisk branded 2 GB micro SD card, a standard SD card adapter, and a two-sided insert sealed in a blister pack. The SD card contains four folders for audio, video, lyrics, and artwork. The video for Get On Your Boots is included as well as the animated video for Crazy Tonight, both in MPEG-2 format and in 3GP format for playback on mobile phones. There are nicely-done custom lyrics sheets for each track. The artwork and audio, however, appear to be where some corners were cut. The artwork is mostly album covers, including one for Pop, which isn’t even represented here. The artwork was obviously lifted from fan sites, as the Get On Your Boots single cover actually includes a web address. When I initially saw the tracklist for this release, I assumed that most of the audio files were taken from U218 because they follow the same running order, but in fact they are all full-length album versions. It also seems that Avrupa Müzik must have turned one of their interns loose on a P2P network to obtain the MP3s, because the bitrates vary wildly from 128 to 320 kbps and everything in between, and there is no consistency to the file tagging. Again, I am not able to verify the authenticity of my copy with 100% certainty, but this appears to be a cobbled-together rush job of a release.